Chard is a French green popular in greenhouses and kitchens around the world. The tender leaves add freshness and a mild buttery flavor to dishes like soup, the bacon-friendly southern dish “greens and beans,” and even in salads or on BCG (beet, chard, and goat cheese) sandwiches. We often recommend chard as a crop for beginners because it is easy to grow and popular in many markets. We’ve been growing chard without soil for years now, and it’s been a popular crop in our greenhouse and indoor farm from the start. The lush leaves grow on elegant stems ranging from red, to yellow, to white, and can get larger than a dinner plate. The cool weather crop is not only tasty and easy to cook but easy to grow in almost any hydroponic or aquaponic system. A multitude of varieties can be found from seed companies; our favorite is Swiss “Rainbow” Chard. Growing chard is fairly simple, and the crop is so resilient that we find it to be a great crop for beginners. Chard is easiest to grow from seed, and germinates within 1–2 weeks. We plant chard seedlings at 8–10 inches apart in the ZipGrow Towers, as the plants grow quite large and can shade each other out if too close. Chard is a fairly tough crop. In our systems, we’ve rarely experienced pests, with only the occasional aphids and (very) occasional powdery mildew problem. And although high or low temperatures will affect the taste, the crop is overall very tolerant of stressful conditions. Chard is ready for harvest 4–5 weeks after being transplanted, and yields well. In ZipGrow Towers, healthy systems produce 4 lbs per 5-foot Tower per 4-week turn and 5.5 lbs per 5-week turn. Growers should only harvest partially, leaving 25–30% of the foliage for the plant to photosynthesize through the next turn. To harvest, clip the largest leaves from the plant, as close to the base of the plant as possible. Harvesting in the morning or evening can help keep chard fresh. When harvested this way, chard plants can yield for several turns in a row. Learn more: see how the Bright Agrotech team harvests different crops! Chard can keep for over a week without beginning to wilt if treated correctly. Chard lasts longest when stored without washing in sealed containers or bags at cool temperatures, which dramatically reduce respiration and decay incidence. Extra chard can be frozen for later use, although this will affect the texture; frozen chard is best used in cooked dishes. Want to get serious with your garden or farm? It’s time to get the training and knowledge to run your dream farm. 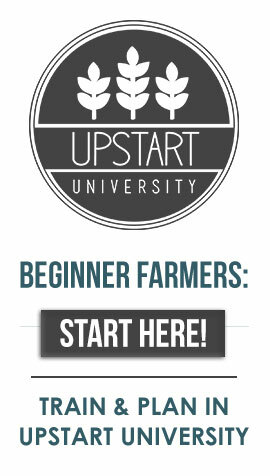 Upstart University offers a variety of farm and farm business classes for new growers of any kind. You can register for Upstart U today for only $9.99/month and start learning from the experts. How would you plant a chard seed in an aquaponics DWC system? How do you make it stay in the raft? Plant the seeds into plugs in a tray and allow them to germinate. Once the seedlings are ready, you can transplant them into net pots that fit your raft and use expanded clay to fill the pots.